How good is Jeter, really? The consistent excellence of Yankees SS Derek Jeter -- at the plate and in the field, in the regular season and in the postseason -- puts him in elite company. 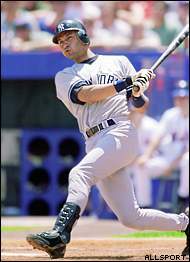 Q: I have just read the Jayson Stark and Rob Neyer columns about Derek Jeter and whether he's in the same class with Alex Rodriguez and Nomar Garciaparra. Both of their arguments were pretty strong. What's your opinion: is Jeter in the same class as them? -- Derek Kanarek, New Brunswick, N.J.
PWG: First of all, range factor is a phony stat. It will tell you that Roberto Alomar is a mediocre second baseman, and he's the best I've ever seen. It doesn't take into consideration instinct. Jeter is the most consistent of the three making the tough play, and he makes the double play -- starting and finishing -- the best. Offensively, he has yet to jump into their class -- partially because he had some injury problems last year, partially because hitting second he controls that inside-out swing and doesn't let go. If you watch him take BP, if he lets it fly, he has tremendous power, and I would not be surprised if he hit 30 homers. I say this each October: the best thing about watching the postseason is watching Jeter play every day for 15-20 games so I go home each winter realizing how great he really is. No stat sheet shows that. PWG: Pedro Martinez's changeup is really a screwball change, ditto Jamie Moyer and others. Maybe the best is Jeff Sparks, but he can't keep it in the strike zone. Q: How is Rey Ordonez's shoulder coming along and will he ever regain his Gold Glove status? And will the Mets upgrade their current rotation and outfield situation? -- Michael Almond, Brooklyn, N.Y.
PWG: Ordonez should be back this season, although there are many in the Mets organization who feel that his flashiness is overrated and that his lack of productivity is a negative. They will make a couple of moves. They are still talking to Boston about Troy O'Leary, although the Mets aren't going to take his salary without Boston taking a Darryl Hamilton. You never know about Sammy Sosa, either. Q: What has Chuck Knoblauch done during the offseason to help improve his focus and Gold Glove winning ability? Also, any thoughts on who the Yanks might bring in midseason? -- Ted Lafiteau, Weston, Fla.
PWG: There are conflicting reports. George King in the Post, who is a very fine reporter, wrote that Knoblauch has been seeing a psychologist, but when the Times went to see him work out, he wouldn't talk or throw with anyone watching. I don't know. I worry about him because he obviously cares far more than he lets on, a natural human response. Q: I'm a huge Reds fan, and Dmitri Young is my favorite player. Do you see Young in a Reds uniform for the full season? And if he is traded, who will take his place? Also, how far is Austin Kearns from the bigs? I played high school ball against him and would love to see him in Cincy soon. -- Aaron Biddle, Burlington, Ky.
PWG: I think this is going to be a .300/30 HR season for Dmitri. In my view, he just needs to be more selective and learn to elevate the ball better. As for Kearns, "Baseball America" has him their No. 1 prospect -- over Adam Dunn -- and probably on the 2003-04 screen. Q: I hear that the Mariners have invited Carlos Baerga to camp, and I would love to see my favorite player back in the major leagues. Do you have an explanation of Baerga's decline in hitting since 1995? Is it just a weight problem or something deeper? Should I find a new favorite who actually plays? -- Bill Stroup, Portsmouth, N.H.
PWG: I think part of it was the weight. He was a bad-bodied guy who, when he lost some of the balance at the plate, lost it overnight. I'd love to see him make it back. Good guy. Q: In your NL Central preview, you said the Cardinals will likely trade Garrett Stephenson. Am I correct in assuming it would be for a third baseman? Beyond Phil Nevin, who is available? Thanks. -- Aaron Watson, Columbia, Mo. PWG: I have to go back, but I didn't say that. I think his arm puts his 2001 season in jeopardy, which is a shame. I don't think they will even think about trading for a third baseman until they see how close Albert Pujols is to St. Louis. Walt Jocketty says he loves Pujols, and his performance in the Triple-A playoffs enhanced his position in the organization. 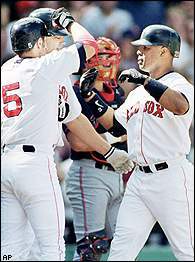 Will Troy O'Leary, right, celebrate home runs for Boston or another team this season? Q: You said in a recent article that the Expos are going to deal Ugueth Urbina for a left fielder who can produce. What about a trade with Boston for Troy O'Leary? As much as I like Troy, he really has no position to play for the Sox and any team can use a quality guy in the bullpen. -- Tom Sabin, Quincy, Mass. PWG: In my mind, since the Red Sox are going for it and John Harrington doesn't care that the payroll is over $110 million because he's selling, I would do it, which is a trade of salaries, and if Urbina is healthy you'd have Rich Garces, Hipolito Pichardo, Rod Beck, Derek Lowe and Urbina. Man. I'd throw in a Shea Hillenbrand or another bat, or maybe a young pitcher. Great idea. I'm more skeptical than most in New England ... but this Red Sox team has a chance to be awfully good, and that bullpen would beat Cleveland, Oakland or whomever they have to face in October if all of them were healthy. Q: What is your impression of the John Vander Wal situation in Pittsburgh? Would you look to trade? Or would you consider giving him a shot at 1B? Or is his role as a fourth outfielder the best place for him? In answering this question consider his poor defense, yet also whom else can bat behind Brian Giles in the lineup? -- Gabe Mazefsky, Meadville, Pa.
PWG: The Pirates have told him that: 1) he asked for the no-trade, and 2) they need him because he can get 450 at-bats at first (remember, Kevin Young has injury problems), left and right. PWG: Giles may be the most underrated offensive player -- he's got power, production, patience. He's probably better in left, where he then becomes a terrific defender. PWG: At the end of last season, Wilson was throwing in the mid-90s, and Larry Rothschild believes he will be one of the comeback stories of the year. PWG: Ramirez was a different player when he came back from the minors, and could be a solid 20-25 HR guy. Rollins is going to be a nice offensive player for the Phils, although they're not certain he's ready for the leadoff position. If Perez can catch the ball, he will help what could be a good Pads pitching staff. I thought that was a solid trade. Q: Why haven't the Mets tried to upgrade their leadoff hitter/outfield. It seems a little risky to rely on Timo Perez for a whole season. Are they counting on Escobar or Giles to contribute this year? Is Marquis Grissom available now that the Brewers added Jeffrey Hammonds? -- Jack Fields, Hackensack, N.J.
PWG: If they do not make a deal, then if Escobar gets off to a good start, he might get into the picture. They could have Grissom, but he hasn't been that productive the last few years and his contract is in the O'Leary range. Q: What are the names that will be followed the closest by scouts in the upcoming Cape Cod league campaign? Who is your pick to be the next Lance Neikro, and who will be this year's Marshall McDougall? -- John Moynagh, Shrewsbury, Mass. PWG: Numero uno will be Falmouth (Rutgers) RHP Bob Brownlie, who was probably the best prospect in the league as a freshman last summer. I haven't seen the rosters yet. If Miami 3B Kevin Howard and South Carolina SS Drew Meyer are back, they were two of my favorites from last summer. And watch North Carolina CF Adam Greenberg.